We finished up our road trip by spending four days in Paris, my absolute favorite city in the world. I could probably write a novel about each and every day I’ve spent there, but I’ll try to spare you all the dramatics and get down to the fast facts. I was SO excited to bring Tyler to Paris. I’ve been obsessed with this city since the day I set foot in it as a broke and bloated college student a few years ago. However, I have heard of a select few heartless individuals who somehow don’t fall in love with the dreamy architecture, flawless food, and overly romantic atmosphere. So I was very nervous that I had talked it up way too much and that it was going to fall flat for Tyler (what would I do then??). It was like when you accidentally over-hype your favorite movie and spend the entire night giving yourself a side-eye headache from cautiously glancing to see if your friend likes it as much as you do. I would not shut up about the blasted macarons and cafes and really worked myself into an un-cute anxious state as we drove into the city. As a fail-safe, I planned that we spend our first night in the city at a Paris Saint-Germain football game. Naturally, Tyler was obsessed right off that bat. (more on the game later). The rest of our time was smooth sailing. Because we had a full four days there (never enough for me, though), we were able to relax and not rush through our time there like we had to our previous stops on this trip. 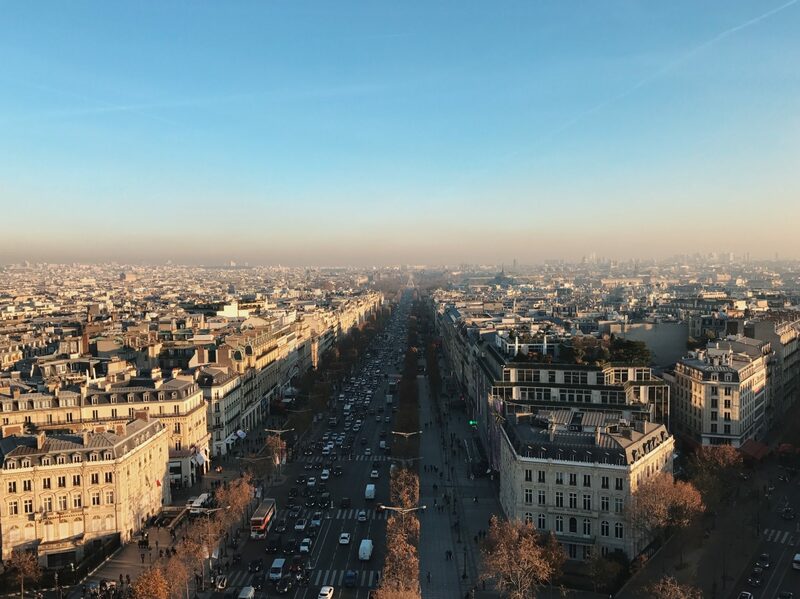 We divided our thoughts on Paris into three posts (this intro, a list of activity recommendations, and then our favorite places to eat). Today, we’ll go over a few basics. Paris can be intimidating–the size, the layout of the neighborhoods, the sheer volume of things to do. We have a few recommendations about how to set yourself up for success and not be completely overwhelmed when you get to La Ville Lumière. Familiarize yourself with a map of Paris. Paris is divided into 20 districts, or arrondissements. The districts are mapped out clockwise, in a spiral, starting from the 1st which is on the Right Bank of the Seine (where the Louvre is). I’m not trying to go all geography teacher on you, but it’s actually really helpful to familiarize yourself with a map of the arrondissements before you get there. It can be really confusing at first. Unlike many of the cities we visited on this trip, Paris isn’t completely walkable. Sure, it’s lovely to get lost and walk for hours through the various neighborhoods, but the city is just really big. For example, it takes over an hour to walk from the Le Marais neighborhood to the Eiffel Tower. Just trying to manage expectations, people. We are ALL for mom-walking and getting those steps in, but it might behoove you to invest in a metro pass for your time in Paris. We actually didn’t find the metro system overly confusing, and it’s a great way to maximize your time if you are trying to squeeze a lot in. Be strategic about where you stay. This brings me to my next point. Everyone has an opinion about which neighborhood to stay in. The great news is that there is a neighborhood for everyone. We LOVED staying in Le Marais (aka the 4th arrondissement). It’s on the Right Bank and SO dreamy. Le Marais has some of the oldest medieval streets in Paris, and there are SO many yummy restaurants, bars, and patisseries. Le Marais is charming, romantic, and relatively calm compared to the rest of the city. The other great thing about Le Marais is its location. A quick walk across the river leads you through Île Saint-Louis (ritzy island in the middle of the Seine River) and then over to the Left Bank in the trendy Latin Quarter. Or, if you head towards the 1st arrondissement, and you’ll stumble upon the Louvre. A couple of other areas we considered staying in were Saint Germain (6th arrondissement– elegant and classy but also charming) or the Latin Quarter (5th arrondissement – hipster, student neighborhood). Both are vibrant and somewhat centrally located. If your time is limited in Paris, we recommend staying in one of these areas. We stayed in an Airbnb, and we feel really strongly that an apartment is the way to go in Paris. This is ESPECIALLY true if you are staying for more than a day or two. Renting your own apartment will ensure that you get the true Parisian experience. You can cook your own food, relax, enjoy tasteful decor, and live like the Parisian king or queen you’ve always wanted to be. Paris can be really overwhelming, but we are here to tell you that it is OK to skip the Louvre if the only reason you are going is to see the Mona Lisa. Because unlike Paris, the Mona Lisa is less than overwhelming. We think there are much better ways to spend your time if you aren’t full-on amped about the art housed in the Louvre. Furthermore, feel free to cut anything else out of your Paris itinerary that you are not 100% excited about. We recommend you pick a FEW select things that you know you will love and just SLOW. IT. DOWN. Choose the one museum that interests you the most (or if you live for classic art, by all means– go nuts). Hunt down those gorgeous desserts you’ve wanted to try for an afternoon. Find an amazing restaurant to spend your whole night at. Do your research. Figure out what you are most excited about. Don’t cram your schedule with things that your Instagram feed (or favorite travel bloggers Tyler and Ruth) made you feel obligated to do. Paris is an amazing city. There is no need to make yourself go crazy by trying to see every blasted painting within the city limits. You can experience so much of the culture by just parking it at a (strategically-selected) cafe, sipping hot chocolate, and enjoying your companions. In our next post, we will detail our very favorite things that we did in Paris. Hopefully that will help you narrow down your itinerary.